The Free Software Community is colored with many happenings and events. Very important on such events is the availability of the major players, including distributions. This sub-project tries to cover all events where Gentoo can present itself. 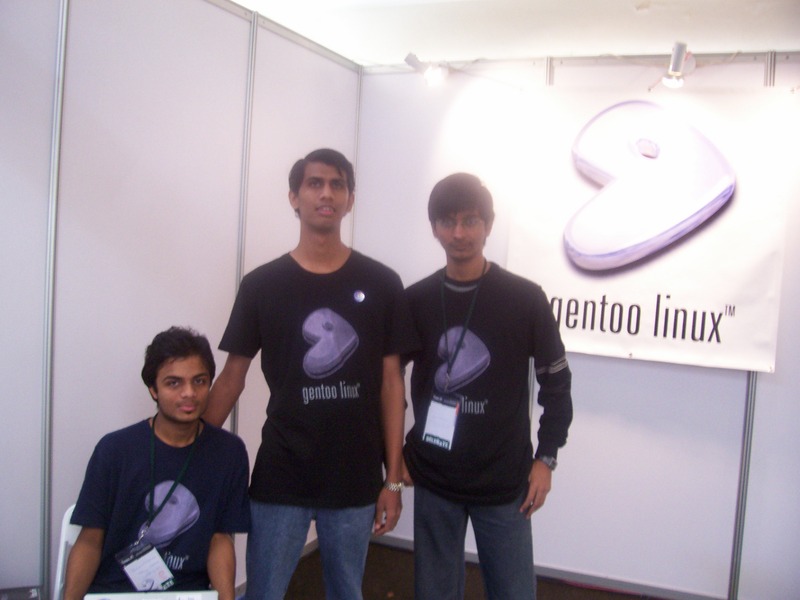 The Gentoo Events project ("events") is the official Gentoo project for coordinating Gentoo's presence at various events hosted by the Free Software Community. This includes trade shows and developer meetings. By providing a single project to attempt to coordinate the Gentoo presence at events, it is hoped that Gentoo will present a more uniform and informed showing. 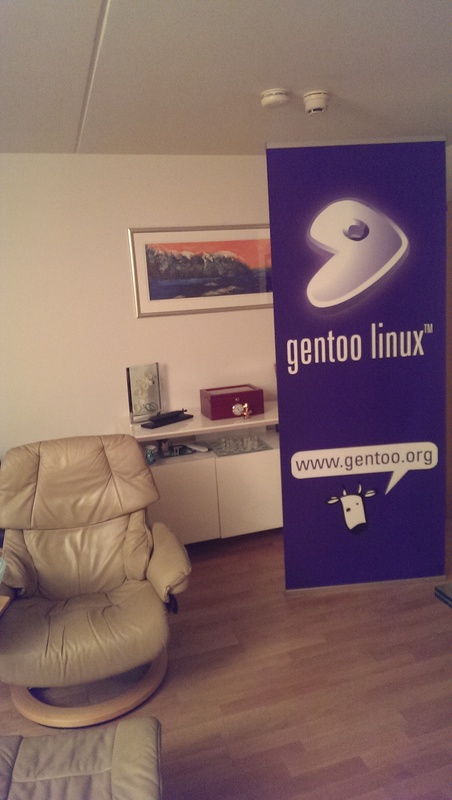 The goal of the Gentoo Events project is to coordinate the Gentoo presence at these events. This includes things such as procuring hardware, assisting developers in their travel and accomodations needs, obtaining printed press materials and release media, obtaining posters and flyers, and generally helping to ensure that our involvement in the event is a positive one that puts Gentoo in a good light, as well as making sure we have fun doing it. If you wish to have your event listed here, please contact the Events team and specify the dates, location, and most importantly, a contact person/address. Someone from the Events team will contact you back. FOSDEM 2019 Belgium, Brussels 2019-02-02 to 2019-02-03 Kristian Fiskerstrand (K_f) FOSDEM 2019, #gentoo-fosdem on Freenode. Open Source Conference Tokyo Spring Tokyo, Japan 2018-02-23 to 2018-02-24 Alice Ferrazzi (Alicef) OSCTS 2018, #gentoo-ja on Freenode. FOSDEM 2018 Belgium, Brussels 2018-02-03 to 2018-02-04 Kristian Fiskerstrand (K_f) FOSDEM 2018, #gentoo-fosdem on Freenode. 34c3 Germany, Leipzig 2017-12-27 to 2017-12-30 Sebastian Pipping (sping) , Chí-Thanh Christopher Nguyễn (chithanh) See the 34c3 wiki for more details. Gentoo New Year Meeting Japan Tokyo 2017-11-25 Alice Ferrazzi (Alicef) Gentoo Study Meeting, #gentoo-jp on Freenode. Open Developers Conference Japan, Tokyo 2017-08-19 to 2017-08-20 Alice Ferrazzi (Alicef) 08-19 presentation "How to became Gentoo Developer"
FOSDEM 2017 Belgium, Brussels 2017-02-04 to 2017-02-05 Kristian Fiskerstrand (k_f) FOSDEM 2017, #gentoo-fosdem on Freenode. 33c3 Germany, Hamburg 2016-12-27 to 2016-12-30 Chí-Thanh Christopher Nguyễn (chithanh) See the 33c3 wiki for more details. Gentoo New Year Meeting Japan Tokyo 2016-12-03 Alice Ferrazzi (Alicef) Gentoo Study Meeting, #gentoo-jp on Freenode. FOSDEM 2016 Belgium, Brussels 2016-01-30 to 2016-01-31 Kristian Fiskerstrand (k_f) FOSDEM 2016, #gentoo-fosdem on Freenode. 32c3 Germany, Hamburg 2015-12-27 to 2015-12-30 codejunky, Chí-Thanh Christopher Nguyễn (chithanh) See the 32c3 wiki for more details. 31c3 Germany, Hamburg 2014-12-27 to 2014-12-30 Chí-Thanh Christopher Nguyễn (chithanh) See the 31c3 wiki for more details. 30c3 Germany, Hamburg 2013-12-27 to 2013-12-30 Chí-Thanh Christopher Nguyễn (chithanh) See the 30c3 wiki for more details. LinuxTag 2013 Germany, Berlin 2013-05-22 to 2013-05-25 Chí-Thanh Christopher Nguyễn (chithanh) See the Gentoo e.V. wiki for more details. 29c3 Germany, Hamburg 2012-12-27 to 2012-12-30 Chí-Thanh Christopher Nguyễn (chithanh) See the 29c3 wiki for more details. LinuxTag 2012 Germany, Berlin 2012-05-23 to 2012-05-26 Chí-Thanh Christopher Nguyễn (chithanh) See the Gentoo e.V. wiki for more details. 28c3 Germany, Berlin 2011-12-27 to 2011-12-30 Chí-Thanh Christopher Nguyễn (chithanh) See the 28c3 Wiki for more details. LinuxTag 2011 Germany, Berlin 2011-05-11 to 2011-05-14 Alex Legler (a3li) See the Gentoo e.V. wiki for more details. Southern California Linux Expo (SCALE) 9x USA, Los Angeles 2011-02-25 to 2011-02-27 ? 27c3 Germany, Berlin 2010-12-27 to 2010-12-30 Alex Legler (a3li) See the 27c3 Wiki for more details. OpenRheinRuhr 2010 Germany, Oberhausen 2010-11-13 to 2010-11-14 Torsten Veller (tove) See the Wiki for more details. FrOSCon Germany, St. Augustin (nearby Bonn) 2010-08-21 to 2010-08-22 Torsten Veller (tove) See the Wiki for more details. Ottawa Linux Symposium Canada, ON, Ottawa, Ottawa Westin Hotel 2010-06-13 to 2010-06-16 Robin Johnson (robbat2) BoF session entitled "State of Gentoo"
Southern California Linux Expo (SCALE) 8x USA, Los Angeles 2010-02-19 to 2010-02-21 ? FOSDEM 2010 Belgium, Brussels 2010-02-06 to 2010-02-07 ? Chemnitzer Linux-Tage Germany, Chemnitz 2009-03-14 to 2009-03-15 amne Booth confirmed, if you want to help poke amne or dertobi123. SCALE Los Angeles, USA 2009-02-20 to 2009-02-22 omp Per our request, our booth has been cancelled. No developers will be able to attend. FOSDEM Belgium, Brussels 2009-02-07 to 2009-02-08 dertobi123, Fabian Groffen (grobian) Booth confirmed, see the Wiki for more details. 25c3 Germany, Berlin 2008-12-27 to 2008-12-30 dertobi123 No booth or something like that, we'll have a dinner with Gentoo people on 27th, poke dertobi123 . The following people contributed to the original document: Chris Gianelloni (author), Alexandre Buisse (author), Tobias Scherbaum (author), Dimitry Bradt (editor), Sebastian Pipping (editor) on August 29, 2010. This page was last edited on 24 April 2019, at 01:25.